Stimulation of anaerobic biodegradation of groundwater contaminants in ground water wells through controlled release of carbon, ZVI, and nutrient delivery using EHC. This is not an aggresive treatment but, rather, an enhancement to natural attenuation. 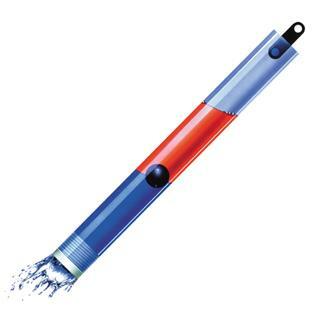 Ideal for sites where there are either residual, or a thin layer of contaminants. The radius of influence depends on the hydrogeology of the site but is still predictably small (in the order of 10 ft radially, 20-50 ft downgradient). EHC is an integrated source of slow-release oxygen combined with nutrients and a pH buffering agent to provide the ideal conditions for rapid bioremediation of organic and inorganic soil, sediment and groundwater contaminants. For organic constituents, EHC significantly stimulates catabolic activity of indigenous microflora further accelerating the rate of contaminant removal. EHC not only eliminates contaminants quickly —but also guarantees appreciable cost savings over other oxygenrelease products on the market. EHC’s proprietary technology is field proven and available today. 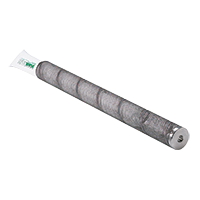 A-SOX is a delivery mechanism consisting of a fabric sleeve (or sock) filled with EHC and a stainless steel canister. 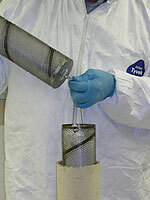 For ease of use in groundwater wells, the socks are lowered in the well inside reusable stainless steel canisters. 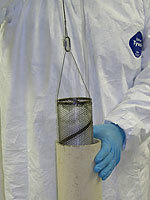 The number of canisters that can be hooked together is limited and governed by well screen length, weight, and the fact that they all need to be submerged. 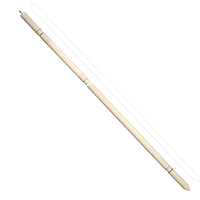 A-SOX is available in two nominal sizes: 2 x 36 in and 4 x 36 in. 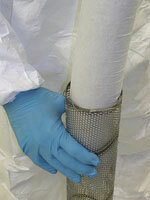 A-SOX sleeves and stainless steel canister available in 2" and 4" sizes. Socks are stored and shipped in pails. • All field proven benefits of EHC. • Substantial time savings on the job. • Reusable stainless steel canisters easy to insert and retrieve. 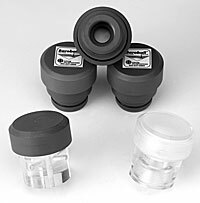 • Socks and canisters available for 2″ and 4″ wells. • Easy and quick delivery system for groundwater wells. • Up to three canisters may be suspended in-line to lengthen the active zone. • Long Lasting. Take a sock from the pail and remove plastic sleeve. If desired, attach an optional canister and insert a sock. Adjust the length of cable required. Lower canister in the well. 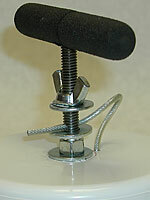 Cap rests on top of casing. 1. What are the main differences between O-Sox and comparable market alternatives? EHC-O O-Sox contain a well-buffered source of controlled release oxygen plus inorganic nutrients (mainly nitrogen) that can accelerate the biodegradation of various organic compounds and enhance certain natural attenuation processes. 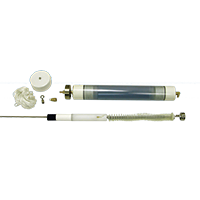 In addition, the O-Sox technology is a practical stainless steel canister and sleeve system which greatly simplifies and hastens installation, removal and replacement. 2. Do I need microbial inoculants? In most cases, the naturally occurring (indigenous) microorganisms are well adapted to the organic constituents of interest and inoculants are not required. 3. What contaminants are amenable to O-Sox treatment? The rate and extent of removal of all organic compounds that are biodegraded under aerobic conditions are usually enhanced via the addition of oxygen and inorganic nutrients. Petroleum-based aromatic (e.g., benzene, toluene, xylene, phenol) and aliphatic hydrocarbon mixtures (e.g., gasoline, heating oil, Diesel fuel, jet fuel, kerosene) are primarily targets; lightly chlorinated ethenes (vinyl chloride), MTBE, dioxane, pentachlorophenol, and many other compounds are also potentially amenable to O-Sox treatment. O-Sox cost about 25% less than market alternatives. 5. Why should I use the O-Sox technology? It’s a better product. And the superior design and ease of application will immediately translate into greatly reduced field time and frustration = reduced project cost. 6. Is it easy to switch over to the O-Sox technology? Yes. EHC-O has been accepted by many state regulatory authorities and it has been employed throughout the USA and Europe. For example, see: EHC Acceptance Letter - Innovative Technologies Florida Department of Environmental Protection. O-Sox are typically replaced every 3 to 6 months. Various site-specific factors will influence the effective lifetime of the O-Sox cartridge; mainly a) constituent type and concentration, and b) hydrogeological features (groundwater flow rate, Eh, pH, temperature). 8. Do I need to install new wells? No. 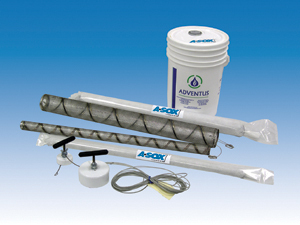 The O-Sox technology is designed to fit into standard 2-inch and 4-inch diameter groundwater monitoring wells. The canisters have a nominal outside diameter of 1.75 inches for the 2-inch size and 3.5-inches for the 4-inch size. 9. What is the oxygen delivery rate? The rated delivery is at least 15 lb of oxygen per 100 lb of EHC-O, after 200 days. 10. Does EHC-O or O-Sox have a shelf life? Yes, about 3 to 4 months in dry storage at room temperature. 11. How many O-Sox can be used per well? 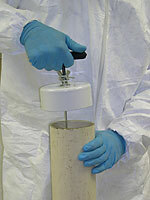 All O-Sox must be placed below the groundwater table and they should be within the screened interval. 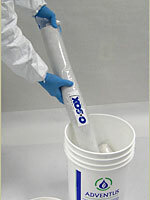 The wet weight of each 2-inch and 4-inch O-Sox unit (3-ft long canister and sleeve) is about 5 and 16 lbs, respectively. 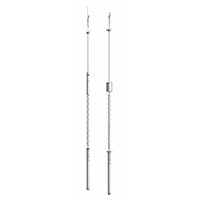 We therefore recommend a maximum linkage of five 2-inch diameter systems (15 ft screened interval; 25 lbs) or three 4-inch diameter systems (9 ft screened interval; 48 lbs). Up to three sets of linked O-Sox units can be used for wells with longer screen lengths.